"Cracow in drawings and words"
We invite you for a stroll around the royal city of Cracow with a panorama of the town. This tour is done with pen and in ink and watercolours by an artist - cartographer. Step after step, for many months Ruben Atoyan was crossing the ancient town with a sketchbook in hand, providing a historical documentation of its streets, squares and backstreets. Concentrating on sketching yards, courtyards, gates, he was climbing the towers of churches, he was descending the basements, he was counting galleries at Wawel, he was looking into Dragon's lair and he was taking a rest at the Planty Park. With unique reverence for details he illustrated the architectural richness of charming Cracow and presented contemporary image of he town full of old walls, tenement houses , schools, theatres, palaces, temples, monasteries, synagogues and bridges. With astute precision he showed the beauty of the Wawel hill, the royal castle and the Cathedral towering over it. Even the old districts of Stradom and Kazimierz are not missing from the panorama as well as nor are pigeons at the Market and coaches in front of Sukiennice. The enclosed text at the back side of the folded version of the panoramic-map, brings closer to those who are interested in the history of the old Polish capital and the history of its most beautiful monuments. The magnifying glass provided alows one to thoroughly investigate thoroughly the medieval urban layout of the ancient town, discover the charm of its details, their precision and artistry. The panoramic map honoured the jubilee of the 2000 year anniversary celebrations, when Cracow was acknowledged as the "Cultural Capital of Europe". 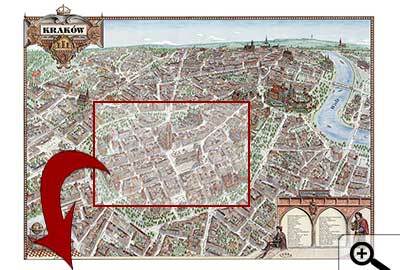 Since then, our panoramic map has become the favourite souvenir and gift of the Wawel town.